Pat McIlhenney of Alpine Beer (center) celebrates with Chuck Silva and Mike Hinkley of Green Flash. Alpine Beer Co., a 15-year-old brewery in Alpine, CA, known for its sought-after IPAs like Duet and Exponential Happiness, was acquired by San Diego’s Green Flash Brewing Co. in early November. In the new arrangement, each company will remain independently operated and maintain its distinct brand and culture. Alpine’s Pat McIlhenney will remain president and brewmaster. Alpine currently employs 20 people, is able to produce a maximum of 1,500 barrels annually at its San Diego County brew house and is distributed exclusively in California, with most of the beer sold directly from its on-site pub. The new agreement will allow Alpine to tap into Green Flash’s resources, including production capacity, access to capital and human resources in operations and administration. 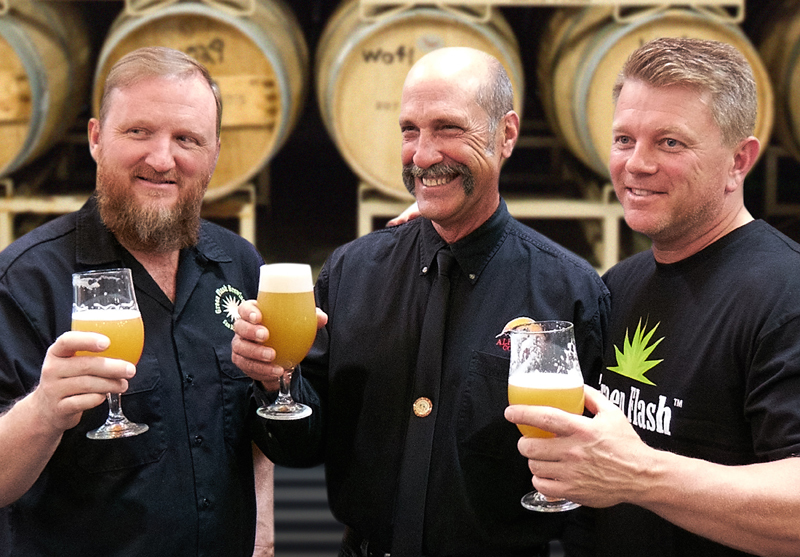 The two breweries are no strangers—in a “handshake agreement,” Green Flash had been brewing three of Alpine’s beers (Nelson, Hoppy Birthday and Duet) since November 2013, doubling Alpine’s annual output to 3,000 barrels. Green Flash will begin bottling select Alpine beers in 22-oz bottles in 2015 and collaboration beers are already in the works. They will start to appear in their tasting rooms and at beer bars in Southern California.